Use of lactose-rich concentrates from dairy processes for the induction of recombinant gene's expression has not received much attention although they are interesting low cost substrates for production of recombinant enzymes. Applicability of dairy waste for induction of recombinant genes in Escherichia coli was studied. Clones expressing Lactobacillus phage muramidase and Lactobacillus alcohol dehydrogenase were used for the experiments. Shake flask cultivations in mineral salt medium showed that cheese whey or deproteinised whey induced gene expression as efficiently as IPTG (isopropyl-β-D-thiogalactopyranoside) or pure lactose. Addition of yeast extract or proteolytically degraded whey proteins did not improve the recombinant protein yield. In contrast, addition of yeast extract to the well-balanced mineral salt medium decreased the product yield. Feeding with glycerol provided sufficient amount of easily assimilable carbon source during the induction period without preventing lactose intake and induction by lactose. High-cell-density fed-batch cultivations showed that product yields comparable to IPTG-induction can be achieved by feeding bacteria with a mixture of glycerol and concentrated whey permeate during the induction. Whey and concentrated whey permeate can be applied as an alternative inducer in recombinant high-cell-density fed-batch fermentations. The yield of the recombinant product was comparable to fermentations induced by IPTG. In low-cell-density shake flask experiments the yield was higher with whey or whey permeate than with IPTG. Many industrially important microorganisms used for synthesis of organic acids, enzymes and vitamins (e.g. lactic acid bacteria, yeasts and moulds) can use lactose as a carbon source. Addition of cheese whey or whey permeate as a lactose-source or as a nutrient supplement has been studied in fermentation processes [1–4]. Generally, however, most biotechnological processes use purified lactose. Especially the use of lactose-rich concentrates from dairy processes for the induction of recombinant gene's expression has not got very much attention although they might be interesting low cost alternative substrates for the production of recombinant enzymes. Lac promoter derived expression systems are generally used for the production of heterologous proteins in E. coli. 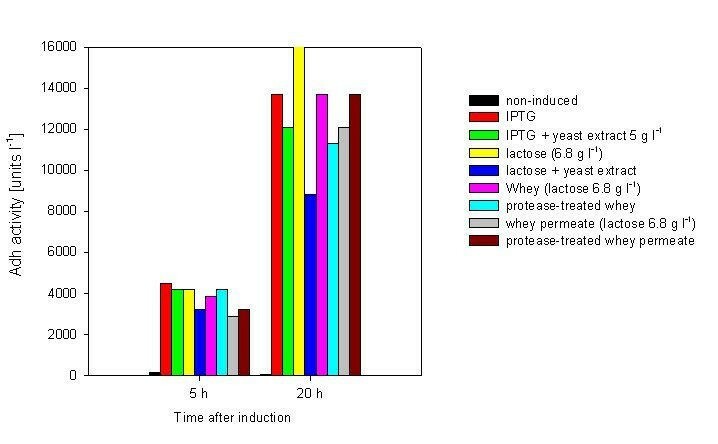 These expression systems are commonly induced by the synthetic lactose analogue isopropyl-β-D-thiogalactopyranoside (IPTG) instead of lactose, because IPTG is effective in small doses, the induction is not affected by the presence of glucose, and the inducer is not metabolised by the cells. IPTG is however toxic and comparably expensive . Lactose has been considered as an alternative inducer in fermentation processes and product yields compatible with the use of IPTG have been described [6–11]. If glucose is used as the initial carbon substrate induction by lactose occurs with a lag phase in difference to IPTG induction. This is due to the general starvation response induced during the diauxic shift [12, 13]. For the studies mentioned above, purified lactose has been used. Lactose is however readily available in a soluble form in dairy by-products (whey and whey permeate). Whey is the by-product of cheese manufacture and contains most of the lactose of milk (about 46 g l-1). Proteins can be removed by ultrafiltration leading to deproteinised whey (whey permeate). The subsequent processes to get pure lactose may include concentration by nanofiltration, also reducing the amount of salts, or by heat. Filtration, thermal treatments and concentration steps imply that this material is relatively free from spoilage organisms and could be therefore directly used as an inducer and carbon source in recombinant fermentation processes. In the actual study we investigated the applicability of lactose-containing dairy by-products (whey and whey permeate) for induction of recombinant gene products. In order to examine whether whey based material has further nutritional value when used as an additive to a mineral salt medium, shake flask experiments with whey and whey permeate were performed. To test applicability of that inducer for high-cell-density cultivations of E. coli in mineral medium, high-cell-density cultivations for the production of recombinant Lactobacillus phage muramidase (Mur) and a Lactobacillus alcohol dehydrogenase (Adh) were done. The substitution of IPTG by lactose or lactose-containing dairy waste solutions was studied with adh expressing clone RB791 pQE30adh in mineral salt medium. This clone was used because the gene product Adh (alcohol dehydrogenase) is considerably nontoxic for the host allowing high product yields and prolonged induction times. Proteolytic treatment with Novo Nordisk enzymes Alcalase (subtilisin endopeptidase) and Flavourzyme (Aspergillus oryzae endopeptidase/exopeptidase complex) were done for some samples, because we wanted to investigate the role of whey protein hydrolysates as a supplement to the mineral salt medium. All the additives corresponded to 14% (v/v) of the culture. The highest activity (units l-1) was measured in cultivations induced with IPTG (0.5 mM) at 5 hours after induction. However, although cells respond much slower to lactose induction, almost as high Adh-activity levels were obtained by using 6.8 g l-1 lactose as an inducer. Also whey as inducer resulted in about the same level of activity (Fig. 1). With ultrafiltrated whey (whey permeate) 30% lower activity compared to lactose was achieved. Protease-treatment did not significantly improve the Adh-production of media containing whey or whey permeate (Fig. 1). The effect of different inducers (IPTG 0.5 mM, lactose, whey and whey permeate) on expression of Adh in E. coli RB791 pQE30 adh . Initial glucose concentration was 1 g l-1. 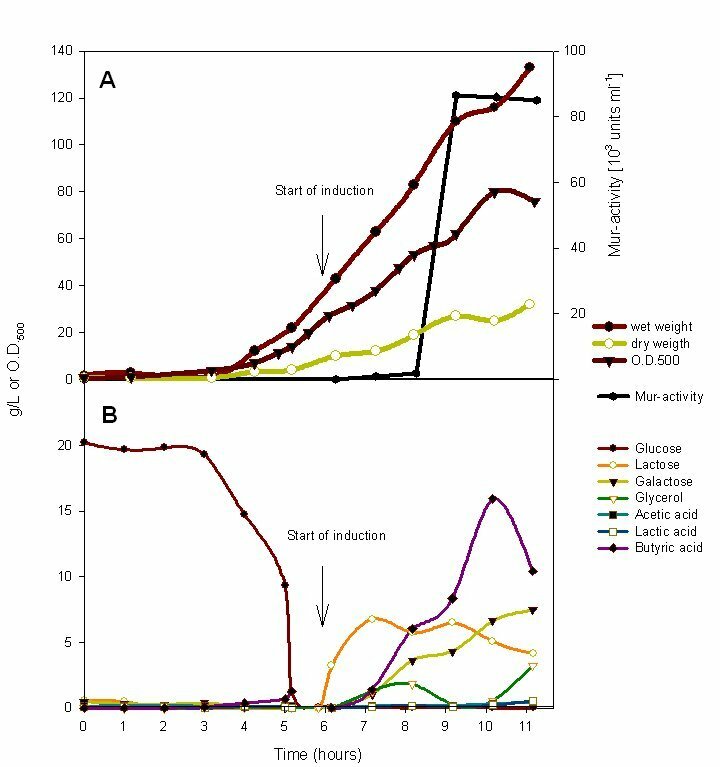 At the onset of induction (at O.D.500 = 0.9), 5 g l-1 glycerol was added to each sample. Adh-production is expressed as units per litre. Yeast extract is often used to improve growth and recombinant protein expression [17–20]. Surprisingly, addition of yeast extract (0.5 gl-1) decreased the yield of Adh both in the case of IPTG and lactose induction. Prolonged induction (20 h) enforced these observations (Fig. 1). Use of whey or whey permeate for induction gave as high yield as 0.5 mM IPTG. Addition of pure lactose resulted in a 17% higher activity at 20 hours after induction. If yeast extract was added together with lactose, the measured Adh-activity was significantly lower. It seems probable that for a well-balanced mineral medium, addition of yeast extract is unnecessary and may be even harmful to the accumulation of recombinant proteins as shown by Ling . These results constitute basis for use of cheese whey instead of pure lactose for induction. Therefore, especially for high-cell-density fermentation processes the use of mineral salt media is recommended. In this connection it should be noted that the mineral medium of Teich et al. has been balanced for the most important minerals and trace elements. Ammonia is used as a nitrogen source and the concentration of ammonia is controlled to a approximately constant non-limiting and non-inhibiting level by the use of ammonia as a pH control reagent in fed-batch fermentations. Presence of even low amounts of glucose (~1.5 g l-1) has been demonstrated to result in lack of induction by lactose in attemps to produce recombinant muramidase in E. coli. This is attributed to prevention of lactose uptake in presence of glucose (Table 1). In contrast glycerol as a carbon source gave good production of muramidase during induction with lactose. Effect of carbon source and inducer on production of muramidase. Muramidase activities in batch cultures (M9 medium) of BL21(DE3) pET21 mur performed with either glucose or glycerol as initial carbon source and by induction with lactose, whey or IPTG. Induction was started at OD500 = 0.8 and activities were measured 5 hours after induction. In samples without inducer muramidase activity was zero. To evaluate advantageous conditions for the fed-batch fermentations, further shake flask optimisation experiments were performed with different combinations of the carbon sources with the adh overexpression strain. Therefore strain RB791 pQE30adh was pre-cultivated in medium containing 1 g l-1 glucose and whey permeate (containing 7 gl-1 lactose) or glycerol + whey permeate (5 g l-1 glycerol, 7 gl-1 lactose). The low amount of glucose was supplied to investigate whether an initial fermentation on the basis of glucose would be possible. 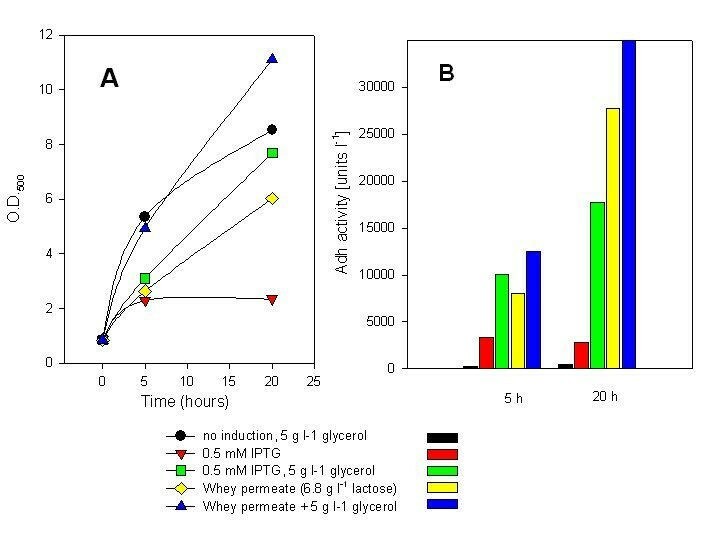 Interestingly, addition of glycerol improved the yield in all cases, but relatively good growth was also achieved by using only lactose (in whey permeate) as a carbon source (Fig. 2). During overnight growth, 43% of the lactose was digested. In the presence of 5 g l-1 glycerol, 46% of lactose and 66% of glycerol was consumed. These data suggest glycerol to be beneficial as an energy source during induction and especially during the period when glucose gets exhausted and energy for the induction of the genes of the lac operon is needed. Production of Adh in E. coli RB791 pQE30 adh with different combinations of the carbon sources glycerol and whey permeate. An initial glucose concentration of 1.0 g l-1 was used in all cultures. Induction was performed at O.D.500 = 0.4. A) growth measured as OD500; B) Volumetric activity of recombinant Adh. It can be concluded from the shake flask experiments that any lactose-containing dairy waste could be used for induction of gene expression. For high-cell-density fed-batch cultivations, concentrated and nanofiltrated whey permeate (CWP, 162 g l-1 total solids, 145 g l-1 lactose) was used for induction. As glycerol was shown to be beneficial for induction (see Fig. 2) a mixture of concentrated whey permeate and glycerol (105 g lactose and 65 g of glycerol per litre) was used as a carbon source during the induction period. During the first hour after induction, lactose and glycerol concentrations raised in the fermentation medium to about 7 and 1.5 g l-1. Thereafter the concentration of lactose decreased, indicating its consumption. Concomitantly galactose accumulated in the growth medium by an approximately constant rate (Fig. 3). In contrast no traces of glucose were detected after induction in either of the fed-batch fermentations (Mur and Adh production) indicating that the glucose part from the lactose was immediately metabolised by the cells. Muramidase production in a fed-batch process of E. coli BL21(DE3) pET mur and induction with concentrated whey permeate/glycerol mixture. A) Biomass and muramidase activity; B) Concentrations of sugars, acids and glycerol during the fermentation. 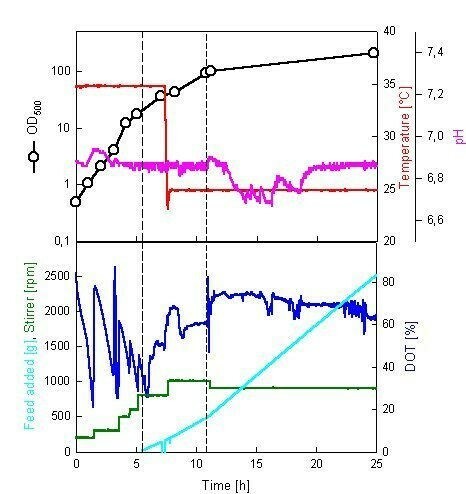 At 4.5 hours after induction the feed rate was shifted from 340 g h-1 to 700 g h-1 because increase of dissolved oxygen level (DOT) suggested depletion of the carbon source. At the end of the fermentation 7.5 gl-1 galactose was detected in the medium. At that time point, about 133 g lactose was used. Accordingly about 25% of the total galactose formed inside the cells was not further metabolised by the E. coli strain BL21(DE3) but was released into the medium. Similar observations have been made earlier by Huber and Hurlburt  who concluded that both products of the β-galactosidase action, glucose and galactose, are transported into the medium, before they are again metabolised. Also in the experiments of Neubauer and Hofmann  galactose accumulated into the medium in recombinant fed-batch fermentations. High-level accumulation of muramidase was found with a delay of two hours after the start of the feeding of CWP (Fig. 3). The maximum amount of Mur was detected at 3 hours after induction, measured as total enzymatic activity (86 500 U ml-1), and no further increase was found in the samples taken during the following two hours (Fig. 3). Also the OD500 did not increase after 4 hours induction (wet cell weight 135 g l-1, dry cell weight 32 g l-1) indicating inhibition of growth. The slight increase in cell wet weight may be explained by surplus of pelletable feed material that was not used by cells or by the growth of whey-borne microorganisms, as discussed below. Muramidase appears to be harmful for E. coli and proportions above 4–5% of total soluble proteins have never been obtained (unpublished results). Based on protein quantification and SDS-PAGE analysis, 4% of total soluble proteins were calculated to be muramidase, altogether 1.08 g per litre of fermentation medium. The competitiveness of CWP induction compared to IPTG-induction was also tested in high-cell-density fermentations for production of Adh in E. coli RB791 pQE30Adh. In contrast to mur expression the adh gene product is non-toxic for the host allowing to be accumulated to more than 50% of the total cell protein after induction with IPTG. The fed-batch growth with glucose feeding (see Materials and methods) was followed by induction with a) 0.5 mM IPTG (constant feed of glucose, not shown) or b) with the CWP/glycerol mixture (Fig. 4). Fermentation conditions during fed-batch production of Adh by E. coli. Start of induction by addition of concentrated whey permeate/glycerol mixture (first broken line) and time point for increase in feed rate (second broken line) are shown. The cell wet weights (200 g l-1 with IPTG and 203 g l-1 with CWP) and Adh-activities (7000 Units g-1 and 7200 Units g-1) after overnight induction were about the same in both cases. After prolonged cultivation with CWP/glycerol as a carbon source, almost all the glycerol was consumed at the end of the fermentation (18 hours after induction, Table 2). At the same time point, only 35% of the total added lactose was consumed. The concentration of lactose at the end of the induction was 23 g l-1 that may be near the inhibitory level that inhibits lactose intake . Fed-batch production of Adh with IPTG and concentrated whey permeate/glycerol mixture. The results were calculated from samples at 18 hours after induction. Lactose can be used for the induction of recombinant genes as well as IPTG. In dairy wastes lactose is available in a readily soluble form. During cheese manufacture, non-sporulating lactic acid bacteria are used, and the thermal treatments in further processes (e.g. whey protein and lactose processes) destroy most of these organisms. Increase in the lactic acid content was not observed during the fed-batch cultivations. However, butyric acid was observed in fed-batch fermentations when CWP was used. Formation of butyric acid started at 2 hours after induction. According to HPLC the final concentrations were about 10.4 g l-1 for muramidase production and 7.4 g l-1 for Adh production. The initial butyric acid content of the feed solution was only 0.5 g l-1. Increase of butyric acid concentration was not associated with its distinctive odour. E. coli is not known to synthesise butyric acid (or the storage compound polyhydroxybutyrate). The observed butyric acid formation could not be attributed to any source or reason with certainty. Despite this, high levels of the recombinant products were achieved. Therefore we conclude that dairy wastes can be directly used for induction of recombinant genes if the product is used as a technical enzyme. Whey and whey permeate are low cost by-products of the cheese manufacturing industry. Due to their high content of lactose and salts whey has been proposed as cultivation additive for microbial cultivations, but so far it is mainly used for the production of lactic acid or used as animal feed. Within the actual study we show that whey, and concentrated whey permeate (CWP) can be applied as an alternative inducer in recombinant high-cell density fed-batch fermentations. The yield of the recombinant product was comparable to fermentations induced by IPTG and in low-cell-density shake flask experiments the yield was higher with whey or whey permeate than with IPTG. CWP is not only interesting from the point of the efficient use of lactose, but it only contains a high salt concentration. Therefore CWP can be directly used as fermentation additive, not causing a dilution of the fermentation medium. Our study shows that whey and CWP can be directly taken as feeding solutions. However in initial batch experiments it was obvious that addition of glycerol has a positive effect on the total product yield. This study further indicates that CWP can be used without any pre-treatment in recombinant fermentations. The cell wall hydrolase gene mur of the Lactobacillus delbrueckii subsp. lactis phage LL-H was cloned between the SacI and KpnI restriction site in the expression vector pET21c (Novagen Inc., USA)  yielding the plasmid pET21mur. The recombinant protein muramidase was expressed in E. coli strain BL21(DE3). The gene of an alcohol dehydrogenase (adh) from Lactobacillus spec. was cloned into the pQE30 plasmid (Qiagen) yielding the vector pQE30adh and the protein was expressed in E. coli Rb791 [F-, IN(rrnD-rrnE1), λ-,lacI q L8] kindly provided by the E. coli Genetic Stock Center (New Haven, USA). Mineral salt medium prepared according to Teich et al. contained 4.0 gl-1 of NaH2PO4 × 2H2O, 14.6 gl-1 K2HPO4, 0.5 gl-1 NH4Cl, 2.5 gl-1 (NH4)2SO4, 1.0 gl-1 (NH4)2-H-citrate and 2.0 gl-1 Na2SO4. The medium was sterilised by heat and further supplemented with 2 mll-1 of separately sterilised trace element solution (0.74 gl-1 CaCl2 × 6H2O, 0.18 gl-1 ZnSO4 × 7H2O, 0.1 gl-1 MnSO4 × H2O, 20.1 gl-1 Na2-EDTA, 16.7 gl-1 FeCl3 × 6H2O, 0.1 gl-1 CuSO4, 0.104 gl-1 CoCl2), 2 mll-1 MgSO4 (1 M), 0.1 ml l-1 filter-sterilised thiamine solution (0.34 gml-1) and ampicillin (100 mgl-1). Overnight cultures were prepared in shake flasks with mineral salt medium supplemented with 5 gl-1 glucose. In high-cell-density cultivations medium contained an initial glucose concentration of 20 gl-1. Whey was a 50:50 mixture of whey originated from manufacturing processes of Edam and Emmenthal cheese in JK JuustoKaira dairy plant (Kuusamo, Finland). Whey permeate (deproteinized whey) was obtained by filtration trough ceramic filter (10.000 Da of cut-off size). Concentrated whey permeate (CWP) was prepared by nanofiltration process trough Desal-5 DK (20 bar inlet pressure, 17°C). On average 21 % decrease of the amount of minerals was achieved when concentrating whey permeate to 160 g l-1 dry matter content. Lactose corresponded for 88 % of the dry matter. For shake flask experiments, pH of whey and whey permeate was adjusted to 6.5 with NaOH. Some experiments were performed with protease treated whey. Therefore whey was incubated with Novo Nordisk enzymes Alcalase (subtilisin endopeptidase, 2.4 AU g-1, 5 μl to 50 ml volume) and Flavourzyme (Aspergillus oryzae endopeptidase/exopeptidase complex, 1000 LAPU g-1, 5 μl to a 50 ml volume) at 40°C for 30 minutes. Whey, whey permeate and protease treated whey were generally incubated for 1 hour at 60°C to reduce the amount of contaminating microbes. For shake flask cultivations, 14% (v/v) of the whey solution was added to start the induction. Induction of recombinant gene expression in high-cell-density cultivation was performed by feeding of whey permeate concentrated by nanofiltration (CWP, 163 gl-1 total solids, 145 g l-1 lactose). This concentrate was mixed with glycerol to obtain a feed solution containing 105 g l-1 lactose and 65 g l-1 glycerol. Primary experiments were done with the Adh clone. One ml of an overnight culture was used for inoculation of a 250 ml Erlenmeyer flask containing 50 ml volume of mineral salt medium and an initial glucose concentration of 1 gl-1. Bacteria were grown under vigorous shaking (250 rpm) at 30°C until OD500 reached 0.5. Thereafter, induction was done by addition of 0.5 mM IPTG, 6.8 g l-1 (20 mM) lactose or lactose-containing dairy by-products. Glycerol (5 g l-1) was added at the onset of induction. Fed-batch cultivations were performed in a 12-l Biostat E bioreactor (B. Braun Biotech. Int., Melsungen, Germany) with an initial culture volume of 6 l. The culture medium was sterilised in the bioreactor. Trace element solution, thiamine, ampicillin and glucose (20 g l-1) were added afterwards. The initial mixing was 200 rpm, temperature 37°C for Mur, 30°C for Adh and initial airflow 4 lmin-1. A polarographic oxygen electrode (Mettler Toledo, Switzerland) was used to register the dissolved oxygen level (DOT). During the fermentation the DOT was maintained at a level above 30% by stepwise increasing the stirrer speed and the airflow. pH was kept above 6.5 by addition of 25% (w/w) ammonia solution. The cultivations were started with a batch growth phase with an initial glucose concentration of 20 gl-1. The addition of a 660 g l-1 glucose containing feed solution (containing the mineral salts of the cultivation medium in the appropriate concentrations) at a constant rate of 80 gh-1 was started when the batch glucose was depleted (indicated by sharp raise in DOT). When OD500 reached 30, the production of recombinant muramidase was induced by changing the glucose feed to a feed solution containing a mixture of CWP and glycerol (whey permeate concentrated by nanofiltration with 105 gl-1 lactose, glycerol 65 gl-1) added by a constant rate of 340 g h-1. After 4.5 hours induction, feed rate was set to 700 gh-1 in response to the increase of DOT. Temperature, pH and DOT were kept the same as prior induction. Induction of adh was started when OD500 was 100 either by adding 0.5 mM IPTG or by changing the glucose feed to the mixture of CWP with glycerol as described above. Otherwise the protocol was the same as for Mur. At the end of the fermentation (15 hours after induction) the wet cell weigth was about 200 g l-1. Growth of the cultures was followed by measuring the light absorbance at 500 nm (OD500), by measuring the cell wet weight and by determination of the cell dry weight. Therefore 1.5 ml cell suspensions were centrifuged in pre-weighed 2 ml test tubes and washed once with 0.9% (w/v) NaCl solution. After removal of the supernatant the samples were measured for cell wet weight and further dried to constancy at 60°C for at least 24 h. In average an OD500 of 1.0 resulted in a cell wet weight of 1 g l-1 or 0.22 g l-1 of cell dry weight. Production of muramidase was estimated from sonicated cell suspension (sonication in the presence of 1% Triton® X-100 MSE Soniprep 150, 4 × 10 sec pulses at an amplitude of 12 μ). The lytic activity of muramidase was measured turbidimetrically in a buffer (50 mM sodium phosphate, pH 5.6, 200 mM NaCl, 10 mM MgCl2) using washed L. delbrueckii subsp. lactis ATCC 15808 cells as a substrate, as described previously by Vasala et al. . The activity of muramidase is expressed as the amount of enzyme that produces a decrease in absorbance of 0.001 units per min at room temperature (22°C). For analysis of Adh activity, 10 to 50 mg of cells (wet weight) were suspended into 500 μl of TEA buffer (100 mM triethanol aminine, 1 mM MgCl2). The cells were sonicated by MSE Soniprep 150 (4 × 10 sec pulses at an amplitude of 12 μ), the cell debris was removed by centrifugation (5 min at 10,000 × g) and the supernatant was used for analysis. Enzymatic activity was measured in a 100 mM TEA buffer (see above). Ethyl-4-chloroacetoacetate (JEP GmbH, Wiesbaden, Germany) was used as a substrate and NADPH (reduced form) as a coenzyme. Oxidation of NADPH (0.19 mM concentration) was followed by measuring the absorbance at 340 nm. Adh-activity is defined as a decrease of A340 per minute divided by 6.22 (the extinction coefficient of NADPH at 340 nm). Protein concentrations were determined by a modified Bradford procedure  with a Bio-Rad DC Protein Assay kit. Bovine serum albumin was used as a standard. Samples were analysed by glycine-SDS-PAGE, using 12% (w/v) acrylamide gels. Bio-Rad SDS-PAGE Standard was used to determine molecular weights. The gels were stained using Coomassie Brilliant Blue (CBB) and unstained under standard conditions. Sugars and acids were analysed with Merck-Hitachi HPLC-system (Model D-7000) and IC Sep COREGEL 87H3 (Transgenomic) column. H2SO4 (0.01 N) was used as a running buffer. Acids were quantified with Merck Hitachi l-4250 UV-VIS detector at 210 nm, sugars with Merck Differential Refractometer EI-71 at 190 nm. HPLC System Manager version 3.1.1. software was used. Before loading to the column, samples were first centrifuged (5 min, 10,000 × g) and filtrated (0.2 μm filters). Mikko I Viitanen, Antti Vasala contributed equally to this work. This work was supported by the Academy of Finland (Project no 71216). The authors kindly thank to K. Breese and O. Ertl (JEP GmbH, Wiesbaden, Germany) for the Adh expression vector and the E. coli Genetic Stock Center (New Haven, USA) for the strain RB791. Special thanks to Mr. Ismo Koskenkorva for skillfull HPLC analysis. The initiative to this work came from TA. Tests for the applicability of IPTG, lactose and whey in batch-fermentations (shake flask and bioreactor experiments) for muramidase-production were carried out by MIV and supervised by TA. This data were applied to shake flask experiments for Adh-production in mineral salt medium by AV. High-cell-density fed-batch cultivations for Adh-production were organized by PN as student course work. Muramise high-cell-density cultivation were performed by MIV and AV. All authors read and approved the final manuscript.